In a world increasingly facing economic hardship and declining standards of living, the spotlight is falling mercilessly on a major culprit in persistent global poverty – shocking levels of corruption worldwide. The World Bank estimates that bribes siphon off about two percent of global GDP, equivalent to 10 times the value of overseas development aid. Most of this money goes into the pockets of corrupt politicians and officials, and into the foreign bank accounts of those in power. Meanwhile, the UNDP says that globally, about US$ 1 trillion is paid out in bribes every year while an estimated 2.6 trillion dollars is robbed from world economies through corruption. This amounts to five percent of global GDP. Developing countries on a fast track to economic development and stability are often derailed by the greed of their leaders and government officials. The World Bank reported that Peru was one of Latin America’s fastest growing countries with an annual GDP growth rate of 6.1 percent between 2002 and 2013. Peru’s growth led it to be considered one of the ‘Pacific Pumas’ together with Mexico, Chile and Colombia. Then the mining dependent Peruvian economy was adversely affected by the collapse of commodity prices and even worse, a gigantic bribery scandal involving Brazilian multinational Odebrecht, which is considered one of the largest corruption scandals in history. This octopus-like graft scheme has led to investigations in over 12 countries and involves their respective presidents. Following the exposure of the scandal, the US Department of Justice levied a US$ 3.5 billion fine against Odebrecht. In Peru alone, three former presidents are facing trial or serving jail time on Odebrecht related charges. Their cases haven’t been helped by Odebrecht admitting that it bribed Peruvian officials to the tune of some 30 million dollars between 2005 and 2014 for contracts valued at around US$ 12.5 billion. The Brazilian construction giant Odebrecht had built the venues for the 2016 Olympics and infrastructure for the 2014 World Cup in Brazil, the metro system in Caracas, and dams and airport terminals in other countries. According to the US Department of Justice, Odebrecht has admitted paying millions of dollars in bribes to a whole host of nations. The company is also alleged to have engaged in bribery in Antigua and El Salvador, and is under investigation for bribing Chilean and Portuguese officials too. Investigations have revealed that the company indulged in a game of quid pro quo. In the targeted countries, Odebrecht employees linked up with individuals in the upper echelons of power and those who appeared likely to ascend to positions of influence. They didn’t care about the politicians’ modus operandi; they were offered similar proposals – election campaign funds for a building contract when they came into office. 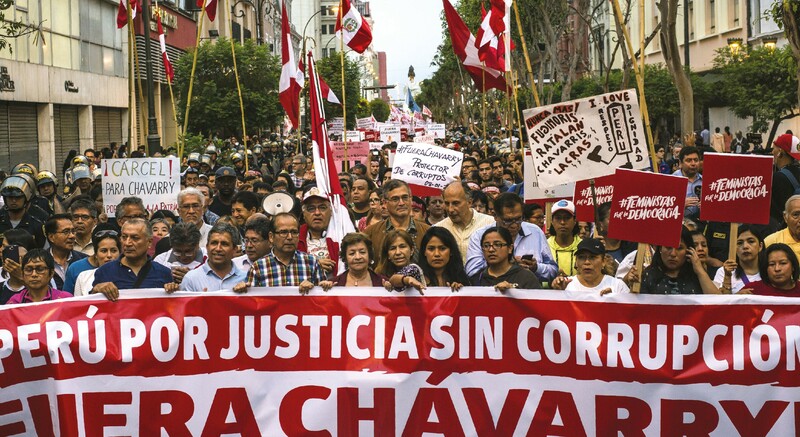 In Peru, two ex-presidents – Ollanta Humala and Alejandro Toledo – are under investigation. Humala and his wife Nadine Heredia were placed in pretrial detention for 18 months until charges are framed for receiving US$ 3 million from Odebrecht for the 2006 and 2011 presidential campaigns. Subsequently, the court released them for lack of formal charges but they’re still under investigation. Toledo is accused of taking about 20 million dollars from Odebrecht and acquiring expensive real estate, and is currently said to be in the US. A Peruvian judge has requested the authorities in the United States to extradite him to be tried in a Peruvian court. Peruvian ex-president Alan García, accused of taking bribes from Odebrecht for government contracts to construct a metro line in Peru’s capital Lima, has sought asylum at the Uruguayan embassy when he was prohibited from leaving Peru. Pedro Pablo Kuczynski is the third Peruvian president to be linked to Odebrecht bribes and is currently under investigation. He was succeeded by Vice President Martin Vizcarra who (with a popularity rating of 45%) has proposed a tough reform package to Congress including amendments to campaign finance laws, new regulations to appoint judges and banning the reelection of lawmakers. These proposals have the voters’ blessing. Meanwhile, the Peruvian government’s recently published data revealed that for the first time since 2001, Peru’s poverty rate increased. Over 6.9 million Peruvians live in poverty today with 44 percent of them being in the rural heartlands. The reason for this we’re told, is uncontrolled presidential greed. OK, but why is there no end to this? This is because of greed. That is the world now.